Peter Schmeichel Manchester Utd & Denmark signed 12x8 inch photo. 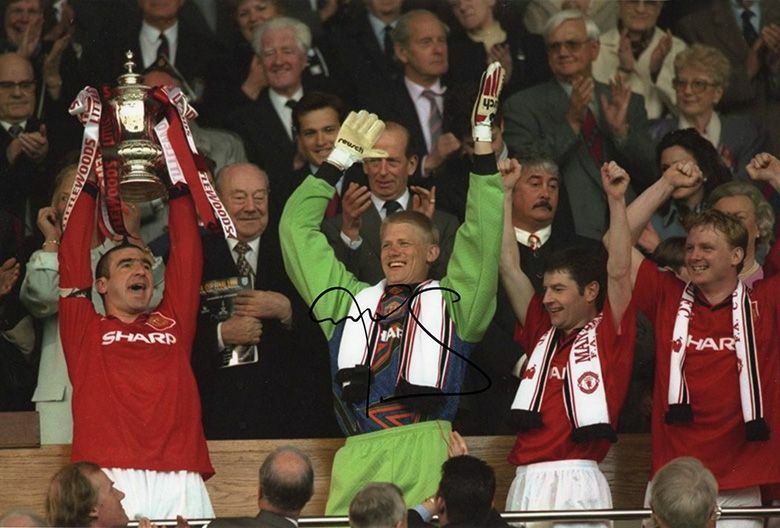 Peter Schmeichel, Manchester Utd & Denmark, signed 12x8 inch photo. 12x8 inch colour photo personally hand-signed in black sharpie pen by Peter Schmeichel, Manchester United FC and Denmark. A difficult autograph to obtain as he doesn't sign many photos. Schmeichel played as a goalkeeper for Man Utd from 1991-1999 and won five Premier League titles, three FA Cups, one Football League Cup, four FA Charity Shields, one UEFA Champions League and one UEFA Super Cup. He also won Euro 1992 with Denmark. Schmeichel is regarded as one of the greatest goalkeepers of all time. He was capped 129 times for Denmark and is their most capped player.